How is it possible that Alfred Hitchcock - possibly the most famous and influential filmmaker of all-time - never won an Oscar as Best Director? Five times nominated, he came up empty on each occasion. This occurred even the one time that a Hitchcock film won Best Picture: 1940's Rebecca. That year, John Ford took home the Best Director prize for The Grapes of Wrath. While my sympathies go to Hitchcock for his consistent slighting at the hands of the Academy, I must admit that I understand their dilemma. Both Ford and Hitchcock were amazing directors, and both their 1940 releases were strong pieces of work. I won't try to argue which of the two 1940 contenders was the better movie but Rebecca definitely offers a fine film. It's a curious kind of romantic thriller, made odd partially due to the fact we never meet anyone named "Rebecca". Indeed, we discover very early on that she's the dead wife of Maxim De Winter (Laurence Olivier), an independently wealthy British manor owner who apparently remains despondent over his wife's demise. During a visit to Monte Carlo, Maxim hooks up with a young cutie played by Joan Fontaine and she quickly becomes the second Mrs. De Winter. The two return to Manderley, his daunting and haunting mansion on the English shore. Unfortunately, the figurative ghost of Rebecca hangs over Fontaine at all times. The manor’s large staff - headed by the icy, Rebecca-obsessed Mrs. Danvers (Judith Anderson) - and local residents remain fascinated by all things Manderley. 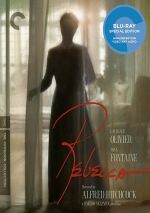 Most of the film focuses on Fontaine’s role and shows the apparent obsession over Rebecca maintained by her husband and the others; we see how this ghostly competition weighs upon her and causes various problems. This being Hitchcock, of course, things are not exactly what they seem, and I'll leave it at that so I don't ruin any surprises. Hitchcock paces the film well and builds the suspense. We just know something nasty will eventually happen, and he creates a delicious tension as we wait for these revelations. Hitchcock seems to take a misstep part of the way through the movie, as we reach what looks to be the ending yet are stuck with quite a lot of additional film to watch. However, more surprises remain, so don't give up on the story. The acting seems terrific from top to bottom. Olivier plays a role emotionally similar to his Heathcliff in 1939's Wuthering Heights, but he brings a lot more nuance to Maxim. Heathcliff just seems stiff and petulant, whereas Maxim appears vaguely warm but haunted. It's easy to understand why he'd look like such a catch to the women of the film. In an unnamed role - which helps make her anonymous and reinforces the dominance of Rebecca – Fontaine may come across as overly simpy and meek for some, but her attitudes make sense. A more forceful personality would overpower the aura cast by Rebecca, and that would make the entire storyline collapse. Fontaine also matures nicely in the part and shows additional growth as the story proceeds. The only objection I have to her casting is that she seems too beautiful. I think we're supposed to believe that the allegedly-stunning Rebecca overshadows Old No-Name in the looks department, and that might be the case, but Fontaine is way too hot for me to believe that Rebecca could have been much sexier. Anderson delivers arguably the strongest performance as the house assistant Danvers. Anderson seems truly creepy in the role but she refrains from a cartoony vibe. While all of the residents of Manderley communicate the allure of Rebecca, Danvers has the most impact on Anonymous, and Anderson makes those scenes a sight to behold. Another wonderful piece of supporting acting comes from George Sanders as an intimate Rebecca admirer, Jack Favell. Sanders' smarmy insolence initially makes him look like nothing more than a typical country-club gadabout, but we later find a darker side to the character. Sanders takes a small part with throwaway lines and infuses him with snarling malice, something that would serve him well in his best-known role, that of Shere Khan in Disney's The Jungle Book. Rebecca didn't impress me as much as later Hitchcock films like Psycho or The Birds, but it nonetheless delivers a strong piece of work. The story of obsession may seem old hat, but Hitchcock's spin on it makes for compelling viewing, especially when complemented by terrific acting. Rebecca appears in an aspect ratio of approximately 1.33:1 on this Blu-ray Disc. I felt pleased with this terrific transfer. Sharpness seemed consistently strong, as the film looked crisp and well defined at almost all points of the film. The shots remained tight when allowed – some stylized photography appeared, but other than these intentionally soft spots, the movie appeared concise. I detected no examples of moiré effects or jagged edges, and edge enhancement remained absent. Print flaws were absent. The movie exhibited natural grain and lacked specks, marks or other concerns. Throughout the film, black levels looked consistently strong, as they always seemed deep and rich. Shadow detail also appeared very good, with a nice level of opacity that rarely looked too heavy. This was a splendid image that brought real luster to the film. I felt fairly pleased with the film's PCM monaural soundtrack, as audio quality seemed quite good for a movie of this vintage. Dialogue sounded clear and relatively warm, and I never had any trouble understanding it. Effects were usually clean and fairly realistic, with little evidence of distortion, and music was reasonably concise. The score lacked much vivacity, but it offered decent clarity for its age. No background noise interfered and this became a good reproduction of a 77-year-old mix. 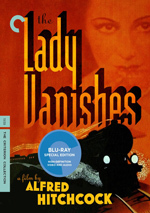 How did the Criterion Blu-ray compare with the MGM release from 2012? Visuals looked a bit tighter and cleaner, while audio seemed a little tidier as well. Though the MGM version worked well, the Criterion disc offered improvements. The Criterion Blu-ray mixes old and new extras, and we start with an audio commentary from film scholar Leonard J. Leff. Recorded in 1990, this piece first accompanied a Criterion laserdisc release of Rebecca. The track holds up well, as Leff offers a thorough and engaging discussion of the film. Leff offers a full and detailed history of the production and many other facets as well. We hear of the fights between Hitchcock and producer David O. Selznick, problems with the actors, ways that the film altered the book, some interpretation of the story and imagery, and many other areas. Overall Leff gives us a fine look at the film that consistently entertains and enlightens, so it’s definitely worth a listen. Another special audio program appears on Disc One. We discover an Isolated Music and Effects Track which offers exactly what its name implies. This lets you watch the movie with all of the sound except for dialogue. Some vocal material remains in the form of background hubbub, but none of the lines can be heard. I can’t say this track does a lot for me, but it seems like an interesting addition nonetheless. The Making of Rebecca goes for 28 minutes and provides notes from film critic Schickel, Hitchcock’s granddaughter Mary Stone, author/film historian Rudy Behlmer, filmmaker Peter Bogdanovich, Casting a Shadow: Creating the Alfred Hitchcock Film author Will Schmenner, UCLA film professor Jonathan Kuntz, Hitchcock at Work author Bill Krohn, Showman: The Life of David O. Selznick author David Thomson, film historian/professor Tom Schatz, Hitchcock’s Music author Jack Sullivan, Hitchcock and Selznick author Leonard Leff, Princeton University Professor of English and Comparative Literature Maria DiBattista, USC Professor of American Film Drew Casper, Alfred Hitchcock: The Legacy of Victorianism author Paula Marantz Cohen, Hitchcock’s America co-editor Jonathan Freedman, Hitchcock as Philosopher author Robert Yanal, Hitchcock and the Making of "Psycho" author Stephen Rebello, actor Bruce Dern, It’s Only a Movie: Alfred Hitchcock: A Personal Biography author Charlotte Chandler, The Hitchcock Romance author Lesley Brill and film historian Bruce Scivally. We get some biographical notes about director Alfred Hitchcock and David O. Selznick before we launch into issues related to the adaptation and production of Rebecca, with an emphasis on the clashes between the two men. “Making” moves briskly and provides a nice look at the project. We get a compelling overview of the film and learn quite a lot in this efficient program. In addition to a re-release trailer, Disc One finishes with a new piece: a chat between film critic/author Molly Haskell and film scholar Patricia White. In this 24-minute, 38-second piece, the two discuss aspects of Rebecca, with an emphasis on the feminist POV. White and Haskell interact well to deliver us a series of good insights. Over on Disc Two, we start with another 2017 program. Visual Effects goes for 17 minutes, 28 seconds and provides comments from film historian Craig Barron. As expected, he looks at various effects and technical elements used during Rebecca, and he makes this a pretty engaging overview. From 2016, Daphne du Maurier: In the Footsteps of Rebecca runs 55 minutes, three seconds and offers notes from professors Helen Taylor and Laura Varnam, author Tatiana De Rosnay, author/editor Piers Dudgeon, bookstore owner Ann Willmore, and du Maurier’s daughter Tessa Montgomery. We also get narration from du Maurier’s notes and some archival footage of her. “Footsteps” offers a biography of du Maurier, with an emphasis on her personality and personal life. It proves to become a better than average program. Under “The Search For ‘I’”, we get four subsections. A Casting Gallery presents 62 screens of text - this includes fascinating memos from producer David O. Selznick and director Hitchcock that give us blunt opinions of many different actresses. Film footage shows up within Screen Tests. We find six reels: “Anne Baxter” (11:48), “Joan Fontaine” (7:57), “Vivien Leigh with Alan Marshal” (4:02), “Vivien Leigh with Laurence Olivier” (5:03), “Margaret Sullivan” (7:52) and “Loretta Young” (4:44). These snippets are a great find. For Lighting and Makeup Tests, we see a three-minute, 14-second piece that starts with shots of Baxter and Sullivan and eventually gets to Leigh. It opens with some comments from Leff, but mostly it remains silent. Baxter’s bit is the most interesting, as we watch a split-screen comparison of some different looks. The Costume Tests focus on Fontaine, as the silent two-minute, 57-second clip shows a variety of different options for “I”. These parts aren’t as compelling as the screen tests, but they’re still a valuable addition to the disc. Archival materials appears under Interviews With Fontaine and Anderson. Leonard Leff spoke with both actresses separately back in January 1986, and the results pop up here. Done by phone, the Fontaine piece lasts for 20 minutes, 15 seconds, while Anderson’s segment runs 10 minutes, 42 seconds. Both add good information about the flick, especially since Fontaine often contradicts Leff’s thoughts! Two old video pieces follow, as we get two segments from Tom Snyder’s Tomorrow show. Fontaine appeared in January 1980 (17:11), while Hitchcock came onto a November 1973 broadcast (44:03). Fontaine’s interview touches on Rebecca and other aspects of her life, while Hitchcock discusses more general components of his personality and career – he makes no mention of Rebecca at all. Both are good and fun to see. The final subdomain on Disc Two covers Rebecca On the Radio. Here we discover three separate radio versions of the story. The first is done on "The Campbell Playhouse". From December 9 1938, this adaptation stars Orson Welles as Maxim and Margaret Sullavan as “I”; it lasts 59 minutes, 54 seconds. Selznick apparently was impressed with this one, for it showed how easily the material could be adjusted to a non-text format. It’s interesting to hear a different take, though I thought Welles was too haughty and simply American in the part. Next we get a "1941 Lux Radio Theatre" version of the material. From February 3rd of that year, this one stars Ronald Colman as Maxim and Ida Lupino as “I”. Both seem wrong for their roles. Colman is too prissy and patriarchal; he comes across like a Henry Higgins take on the part. Lupino displays little more than breathy innocence, and feels like an addled Snow White. Nonetheless, it’s fascinating to listen to this 59-minute version. Lastly, we find another Lux program. This is the "1950 Lux Radio Theatre" adaptation from November 6. The 60-minute, 35-second broadcast finds Olivier back as Maxim and finally puts Vivien Leigh into the lead as “I” a decade after Olivier first stumped for her. This show again demonstrates how wrong she was for it, as she comes across as overly self-assured and mature. Of course, the fact she was 37 at the time, which really did make her too old for the part. As with the others, this is a flawed rendition, but it’s still cool to hear. And if anyone doubts the programs went out live, check out the woman in the crowd who hacks her way through the performance! The package of Rebecca finishes with a booklet. It features an essay from critic/biographer David Thomson as well as correspondence from producer David O. Selznick. It finishes matters on a high note. While Rebecca may never be one of my favorite Hitchcock flicks, it nonetheless holds up well. It remains a compelling and haunting experience. The Blu-ray offers excellent picture and supplements as well as more than competent audio. This turns into the best version of the movie to date.